Seniors usually get swollen feet because they are often not active. This lack of being active makes fluid to build up in their feet. Sometimes, swollen feet in the elderly can be caused by particular health conditions like arthritis, diabetes, obesity, heart disease, liver disease, kidney disease and others. One of the best methods of managing swollen feet is to wearing shoes that are too tight. Such shoes can lead to issues such as foot ulcers, fractures and disability. Instead, you should get shoes that fit well or that can be easily adjusted to fit your feet. Seniors with swollen feet shouldn’t just wear any kind of shoes. They are supposed to find shoes that are suitable for their condition. Swollen feet are larger than their normal size. However, this doesn’t mean wearing oversized shoes will solve the problem. Sometimes, swollen feet will subside and render your oversized shoes useless. On the other hand, the swelling can increase, therefore rendering normal sized shoes useless. To avoid this, buy normal size shoes. However, the shoes should be able to adjust themselves to the size of your feet at all times. Swollen feet shoes should be comfortable to accommodate your feet without you feeling any pain. This is why shoes with adjustable Velcro flaps and well-padded interiors are the best for the elderly. Heavy shoes are difficult to lift and move. They are even more difficult for the elderly to use, especially those with swollen feet. Wearing heavy should can lead to pain on the feet. The best elderly shoes for swollen feet are those that are light in weight. You don’t want to begin looking for a new pair of shoes just after recently purchasing a new pair. When purchasing shoes for seniors with swollen feet, durability is an important aspect to have in mind. When shopping online, it can be difficult to know the durability of a pair of shoes. However, you can read customer reviews of shoes for swollen feet to find a good quality pair. The best shoes for the elderly are those that can be worn and removed without any difficulty. Shoes with buckles and laces can be difficult to cope with. Seniors should buy shoes with Velcro adjusters because they are easy to wear and remove. Although this sounds trivial, it’s also an important aspect to consider. The color of shoes can either motivate or discourage the elderly from wearing them. As a caregiver, find shoes with the color that the seniors you are looking after prefers. There are a variety of shoes for the elderly in the market. It can be challenging to know which brands have the best shoes for seniors with swollen feet. Luckily, we’ve outlined some of the best shoes based on the brand reputation, buyer opinions, prices and several other important factors. Pick what you think will be perfect for your senior. Below are two brands with the best shoes for elderly men with swollen feet. The Propet Men’s MPED3 Pedwalker 3 Oxford shoe is made of nylon and leather. The sturdy shoe has a Velcro adjuster that makes it easy to wear, remove and adjust to fit any feet sizes. The interior of the shoe has a padded collar and a mesh lining while the sole is made of rubber. The shoes has a double air-infused rubber-in sole that makes it comfortable. The in-sole has sufficient cushioning to take pressure off the feet. The Propet Pedwalker MPED3 is very durable. The shoes have a combination of full-grained leather and neoprene in the exterior, which makes it resistant to unfavorable weather conditions. If you care about elegance and good looks, the Propet’s Pedwalker 3 is the best shoe for you. As of when we were reviewing this product, the Propet Men’s MPED3 Pedwalker 3 Oxford has over 200 reviews at Amazon. Majority of the reviews are positive, with most customers happy with its comfort, fit and durability. 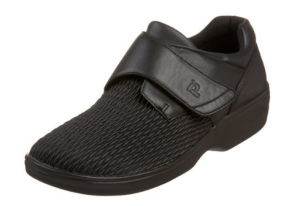 The Propet Men’s Cush n Foot Shoe is light in weight and has a Velcro adjuster. This is why it is one of the recommended shoes for senior men with swollen feet problems. The shoe has a durable synthetic sole made of polyurethane and a removable terry coat insole that feels good on the feet. The shoe also has a supportive, snug feel which leaves your feet comfortable regardless of how long you’ve been wearing them. It also provides excellent traction for both outdoor and indoor use. The Propet Men’s Cush n Foot Shoe has many positive reviews at Amazon. Majority of customers are happy with its snug fit, durable as well as design. Below are the best shoes for senior women with swollen feet problems. The Propet Women’s Olivia Slip-On Shoe is made of sports-stretchable vamp and supple leather upper. Like the other shoes found on this list, it has a tongue and hook fastener that make it easy for the elderly to wear and remove. This shoe is the perfect choice for elderly women because it has an adjustable strap. Its removable REX sole with custom orthics provides maximum comfort. This guarantees a perfect fit every time the shoe is worn. However, the Propet Women’s shoe has one downside; its leather mesh isn’t easy to clean. If you wear the shoes outside and they can become dirty, be prepared to use a lot of effort to clean them. Apart from that, every other feature of the shoe is cool. 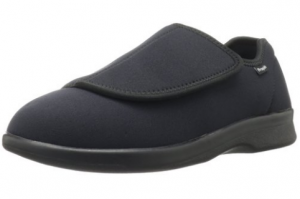 Presently, the Propet Women’s Olivia Slip-On Shoe has over 100 customer reviews on Amazon. Majority of customers are happy with the price, durability and fit of the shoe. The Propet Women’s Cronus Comfort Sneaker is a sporty shoe made of neoprene and has a durable rubber sole. The shoe is designed to provide people with painful and swollen feet maximum comfort. This is why neoprene is used on it. The material is breathable and easily stretches to accommodate different feet sizes. 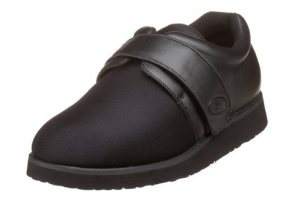 The Propet Women’s Comfort Sneaker has a removable rubber insole and a Velcro adjustable strap. These two provide maximum flexibility and cushioning. The downside of this shoe is that it doesn’t offer any arch support. However, this is not a major issue if you intend to use the shoes indoors. The Propet Women’s Cronus Comfort Sneaker has over 200 reviews from customers that have bought it at Amazon. Majority of the reviews are positive, with most people happy with its fit, durability and non-skid nature.